A rupture of the uterus (womb) is a dangerous complication of pregnancy and labor, and it can be life threatening for both the mother and baby. 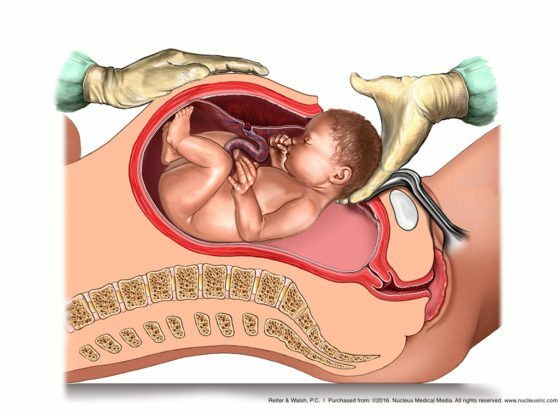 Uterine rupture refers to complete disruption of all uterine layers, which typically occurs when the forces of uterine contractions associated with attempted vaginal delivery cause the uterus to tear open, potentially causing the unborn baby to spill into the mother’s abdomen. When this occurs, there often is hemorrhaging (rapid, uncontrolled bleeding) that can cause the baby to be severely deprived of oxygen (hypoxia). This can lead to permanent brain damage from hypoxic ischemic encephalopathy (HIE) resulting in developmental delays and cerebral palsy. A uterine rupture can be caused by a preexisting injury or trauma, but a rupture is most commonly associated with a trial of labor after C-section. In this case, the separation of the C-section scar during labor causes the rupture. It is further recognized that the induction or augmentation of labor in patients who previously had a C-section, called a VBAC (vaginal birth after C-section), puts patients at an increased risk for uterine rupture. Thus, most physicians will not use prostaglandin agents such as Pitocin / Oxytocin to either induce or augment the labor of a patient who had a previous C-section. In fact, due to the serious risk of uterine rupture with a VBAC, the American College of Obstetrics and Gynecology (ACOG) only recommends VBAC in very low risk cases where patients are carefully chosen and given informed consent. Indeed, risk of uterine rupture is greater in women who have had a prior C-section. In fact, if the uterus has no scarring, the occurrence of a rupture is estimated to be less than 1% of pregnancies. Rupture in an unscarred uterus has been attributed to inherent or acquired weakness in the middle layer of the uterine wall, which functions to induce contractions, as well as disorders of the collagen matrix and abnormal architecture of the uterine cavity. Overdistention of the uterine cavity (e.g., carrying a large (LGA) baby) is the major physical factor in these cases of rupture. Labor that takes longer than expected due to slow cervical dilation can place prolonged stress on the uterine wall , with eventual loss of the wall’s integrity. Other risk factors include trauma and obstetrical maneuvers. The classic signs, however, have been shown to be unreliable and frequently absent. Prolonged, late or variable decelerations and bradycardia seen on fetal heart rate monitoring are the most common and often the only manifestations of uterine rupture. In most cases, signs of fetal distress will appear before pain or bleeding. It therefore is crucial that physicians closely monitor the mother and baby, and be prepared to perform an emergency C-section if indicated. Furthermore, the time between diagnosis of a rupture and delivery should be less than 18 minutes in order to avoid brain damage from HIE/asphyxia. If physicians fail to properly monitor the mother and baby, fail to notice signs of a rupture, or fail to quickly deliver the baby, the baby could suffer severe hypoxia, which can lead to a permanent injury known as HIE. HIE is defined as a brain injury caused by inadequate oxygen and blood flow to the brain near the time of birth. Hypoxia is an inadequacy of oxygen in the body’s tissues, ischemia is a restriction of blood supply, and encephalopathy is a term used to describe a disease of the brain. Cerebral ischemia or hypoxia for just a few minutes may result in irreparable brain damage, as brain cells start to die. In terms of long-term, permanent injury, HIE may cause intellectual and developmental disabilities, cerebral palsy and seizures. It is imperative that close monitoring of a mother and baby occur near the time of and during delivery, especially if a mother has risk factors for uterine rupture. Continuous monitoring of the baby must take place, and it is essential that physicians pay close attention to the fetal heart rate and be prepared for an urgent delivery – usually by C-section. Failure to properly monitor the mother and baby and to notice signs of a rupture is negligence. Failure to follow standards of care and to quickly and properly deliver the baby also constitutes negligence. If this negligence leads to permanent injury in the baby, it is medical malpractice. 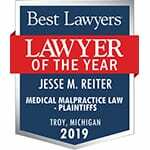 The nationally recognized hypoxic ischemic encephalopathy (HIE) lawyers at Reiter & Walsh ABC Law Centers have decades of experience with birth injury cases, including HIE, uterine rupture and VBAC cases. If you experienced any of these complications during pregnancy and your child developed an injury such as HIE, we can help you. 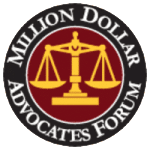 Our skilled attorneys will work tirelessly to obtain the compensation you and your family deserve. Call us at 888-419-2229 for a free consultation. Our award-winning hypoxic ischemic encephalopathy (HIE) lawyers are available 24 / 7 to speak with you.